The latter half of 2015 (July until December) saw Casidra, an implementing agency for the Western Cape Department of Agriculture (WCDoA), channelling its capacity to manage the Disaster Management Programme in the Province on behalf of the WCDoA. Casidra’s role in the project was to act as the engineer to manage the contract administration using the General Conditions for Construction for Civil Works. The WCDoA’s resident engineer played a significant role in providing the necessary support on site. 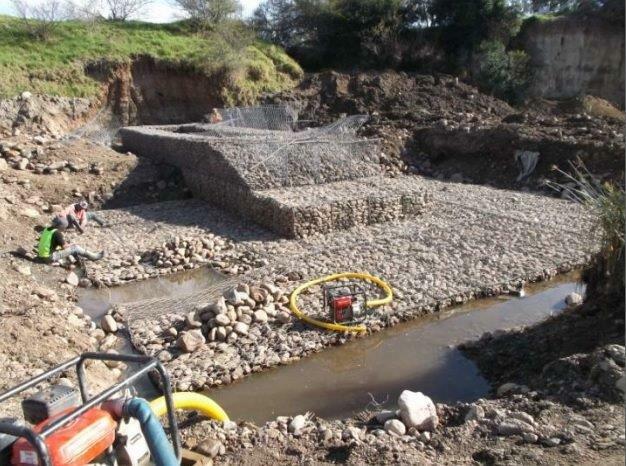 The rehabilitation of approximately 800m of river channel and the construction of 12 river bank erosion protection structures in the Grootvadersbos River situated between Heidelberg and Swellendam. The construction of flood repair and prevention measures along the Buffeljags River (above the dam) in Swellendam. The sediment and alien vegetation were removed from the river bed and banks to reduce the indigenous vegetation capacity to protect the river from erosion. Groyne structures were constructed along the river banks to protect erosion, while limited landscaping and re-vegetation took place between the structures. This work was perpetuated as a result of the extensive flood damage along the river banks in the three catchment areas of Swellendam during the floods of 1996, 2000 and 2004. The WCDoA set disaster funding aside with the aim of limiting further flood damage to the river banks as well as adjacent agricultural land and public infrastructure. According to Casidra’s Project Manager/Engineer, Jacques Swanepoel, the work is a benefit to the society for the protection of the natural environment, specifically the riverine environment and adjacent agricultural land as well as minimisation of the associated downstream negative impacts. The local farming land will be protected from flood degradation, which will have a positive impact on the farming community.